Eli and Rebecca Lapp and their Colonial Stables sure have made their presence known in the Morgan community the last few seasons, and 2018 appears to be shaping up to be their best one yet! EKL Shakedown (Centerpiece x EKL Standing Sensation) is a 4 year old Stallion purchased by Alicia Owens as a weanling out of the Colonial Stables field in late 2014. 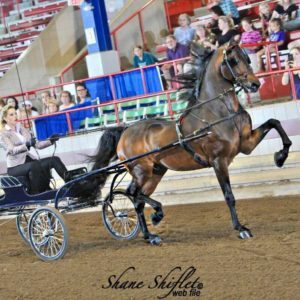 Impressive then, and even more so now, this long legged gorgeous stallion made his show ring debut at Syracuse International, winning the Morgan Junior Park Harness in his only appearance. EKL Sophisticated Lady (SpiceOLife Present Tense x EKL Joyfull Vision) was a star her first time through the gate, winning the 3 year old English Pleasure at the Syracuse International Horse Show! This tall, brave bay mare gets better by the day and she has never had a bad one under saddle or in harness! Buy her now, because you won’t beat her later! EKL Visualize (Paladin Pazazz x EKL Joyfull Vision) made her saddle debut a great one, winning the Junior/Novice English Pleasure at Summer KickOff. This fancy 4 year old thinks the best and is amateur ready NOW!! 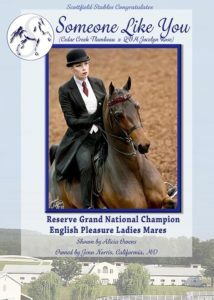 EKL Girl From Ipanema (Man In Motion x Illustra Aurora) continues to be undefeated under saddle, having won both of her Park Saddle classes at Summer KickOff following her undefeated 2017 showings that culminated in her winning the 4 year Old English Pleasure Mares Grand National Title! Owned by Beth and Dave Grella of Tully, NY, this fancy mare has been brought along very thoughtfully and is ready to continue her winning ways for the amateur or junior exhibitor who likes them spicy, bright and bold! EKL On The Edge (SYP High Definition x EKL Standing Sensation) has joined the string here at Scottfield; Ashton Vattlena made the smart purchase in May, and looks forward to developing this snorty gelding to become her future English Pleasure mount. 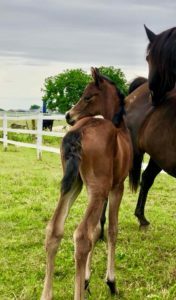 The TEAR It Up Partnership (Tuffy & Alicia Owens and Eli & Rebecca Lapp) welcomed a beautiful bay maternal half sister to Shakedown in May. By the multi-titled World Champion Dressed Up (Mizrahi x Unraveled (by Centerpiece)), this darling filly we are calling Everly is marked like her famous sire and we sure hope she follows his path down victory lane! If you are looking for an upheaded, great thinking show horse, you would be hard pressed to beat the consistency and quality within the Colonial Stables breeding program! We haven’t had a miss here yet at Scottfield! In addition to EKL Visualize, EKL Sophisticated Lady, and EKL Girl From Ipanema, we have two lovely yearling fillies (one a full sibling to EKL Shakedown and the other out of the Park Harness Champion Super Moon) standing in the field right now waiting for your inspection! 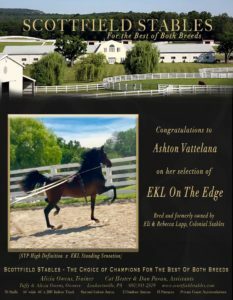 For more information on these and other EKL prefixed superstars, check out our Sales List!! We had a busy spring and early summer here at Scottfield! April saw the arrival of two new families to the Scottfield Team. 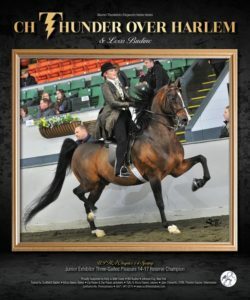 Bringing with them their eye catching giant bay show pleasue gelding, CH Thunder Over Harlem, we were excited to welcome the bold riding blonde, Lexis Budine, and her family, Kelly, Matt and Bill! 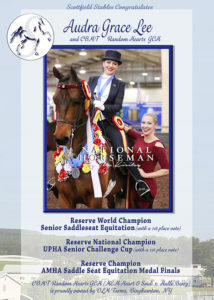 Hailing from Binghamton, NY, and new to the horse show world, this dynamic team has already made a splash, earning top ribbons in giant classes at both the UPHA Chapter 14 Spring Premiere and the Devon Horse Show. We have our sights set on Louisville, and Lexis is looking forward to living at the farm this summer to practice her ringmanship skills in preparation for the big dance. 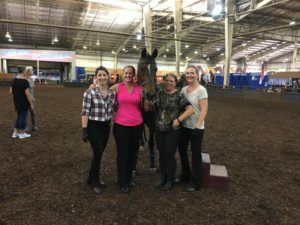 If you have been around on the New England/New Jersey circuits at all in the past ten years, you have heard the name Windy Hill Superstar announced time and again, with countless riders, as the winner of countless classes. Owned and loved by the Musolino Family from Frenchtown, NJ, “Scooby,” along with Ava’s prospect horse, Flora Anna, made the move to Scottfield in early May. With the help of her faithful equine partner and supportive parents, Amy and Rocco, Ava has gained tons of confidence and is improving by the minute! Welcome to the Team, Ava!!! We also enjoyed some nice sales activity recently. We would like to congratulate Tuffy Owens on his purchase of Smoke ‘Em If You Got ‘Em. 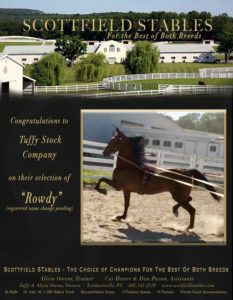 “Rowdy” is a leg waving little firecracker who looks to be a top Morgan Park or English Pleasure Prospect. Only 4 years old and new to the show barn experience, we look forward to seeing what all this cool gelding has in store for us! Ashton Vattelana and Melissa Ferrere both made equine upgrades within 24 hours of one another with Ashton purchasing the gorgeous 2 year old gelding, EKL On The Edge (“Cliff”) from owners/breeders Eli and Rebecca Lapp, and Melissa purchasing the expressive hooked up bay Saddlebred mare I’m In A Tizzy from Alicia Owens just a few weeks after Alicia snagged this fancy bay mare at the Bonnie Blue horse show. Both of these owners are looking forward to watching their prospects blossom and are prepared to be involved in the rewarding process of “making” a show horse. Speaking of Eli and Rebecca Lapp, they added the incredibly well bred mare, Indian Creek Lady Elizbeth (Mizrahi x LongAcres Broadway) to their already impressive broodmare band; we look forward to seeing what “Indy” produces for their Colonial Stables program. Welcome to everyone, and congratulations to all! Children’s Benefit, to UPHA Chapter 14 Spring Premiere, on to Bonnie Blue, back in Pennsylvania for Devon, up to Summer KickOff and finally home from Syracuse International! Regardless the show, the results are the same: smiling, wining, dining, shopping and riding with our fair share of winning to boot, we are having a blast here at Scottfield! After a very very long search, and several close-but-not-quite-perfect finds, I was able to find the PERFECT partner for horse crazy Scottfieldian, Charlotte Towery, to debut in 2018 in the 13 & Under Equitation division!! 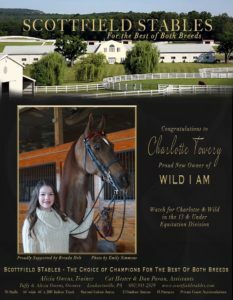 Scottfield welcomes the effervescent and multi-titled gelding, Wild I Am, to the Scottfield family. Wild his fun personality, happy expression and brave go-forward attitude, he is everything I was hoping to find for Miss Charlotte. And the best part is that grandmother, Brenda Helt, approves!! 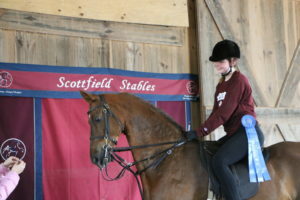 Scottfield also welcomes the long time horse show family, the Earlywines, to Scottfield Stables. Partnered with Tango’s Supreme Kiss, (“Smooch”), for the 2018 season, Elaine’s daughter, Kimberly, will compete in the Junior Exhibitor Park division under the SFS banner. Kimberly has been a wonderful addition to the team, and is enjoying a short commute of 90 minutes that allows her to ride every weekend. Thank you to Cater Stables for suggesting Scottfield to the Earlywine’s! They fit right in here! And thank you to TJ Santaferra for helping me find both of these grand geldings for these two lovely young ladies!! Wild I Am is formerly owned by Jacquelyn King, and Tango’s Supreme Kiss is owned by the Paverd family, and is being leased for the 2018 season by Elaine Earlywine. New to the training barn is the lovely Spice O Life Present Tense daughter, Hartland Rive Gauche. “Colette” is being prepared for the 2018 NY Sweepstakes Class. 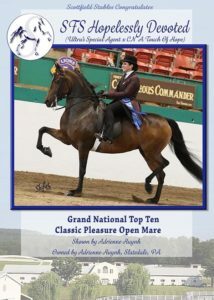 Owned and bred by Hartland Morgans of Windsor, NY, this good thinking mare continues the legacy of the solid Hartland Morgans breeding program. 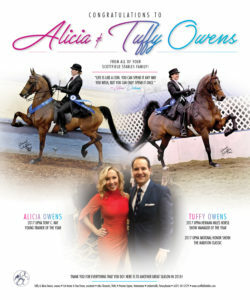 The United Professional Horseman’s Association honored both Tuffy and Alicia with prestigious national awards at their annual Conference held at the beautiful Amelia Island Resort. The Young Professional of the year award is given to leading professionals under the age of 35; nominations are offered by way of consensus from fellow Young Professionals, with the ultimate winner being chosen by the UPHA executive board. 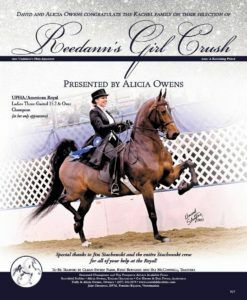 Joining the ranks of such notable trainers as Smith Lily, Matt Shiflet and Tre and Emily Lee, Alicia is honored to be the first recipient to represent the Morgan breed, and humbly expresses her gratitude to the fearless female trainers who have paved the way for all of the young women who have chosen training show horses as a career. See Alicia’s acceptance speech here! Tuffy received the UPHA Herman Miles Horse Show Manager of the Year Award, and his Madison Classic show was recognized as the UPHA National Honor Show of the Year! The executive board selects one show out of all of the events throughout the country that best exemplifies their vision for a horse show, and Tuffy’s show was their selection for 2017. See Tuffy’s acceptance speech here! Stylish In Black Sold to New Home! Congratulations to former owners, Dr. Jen Makem, and parents Tom & Teddy Makem, on the sale of their Nutcracker mare, Stylish in Black! 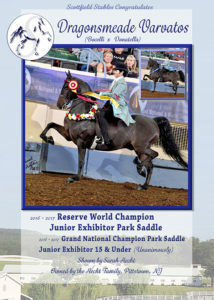 This grand mare will be joining the Kierson Farm family to enter the Junior Exhibitor ranks in 2018. Congratulations to the Chen family of Flemington, NJ, on their selection of Sadie! 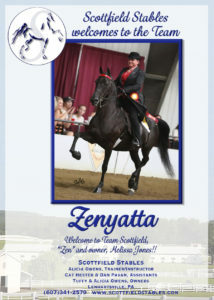 Welcome to the Team, Melissa Jones and “Zenyatta”! We are always excited to welcome new customers! 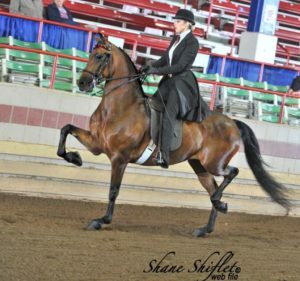 We welcome to Scottfield Stables, Melissa Jones and her Morgan mare, Zenyatta! 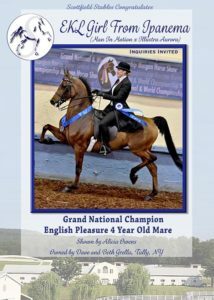 Scottfield Stables Congratulates our 2017 World and Grand National Champions! It seems like every year we return from Oklahoma, I ask myself how we are ever going to top the year we just had, and given how well 2016’s edition of the Grand National went, I thought surely we couldn’t come home any happier in 2017. But this year’s string came through with flying colors, and we are happy to report another very successful Morgan Grand National and World’s Championship Horse Show, arguably our most successful one yet!! 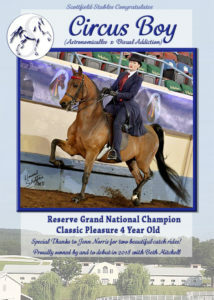 To be shown by Beth Mitchell in 2018 in the Classic Pleasure Saddle division! And congratulations to Ashton Vattelana, April Wozniak, Sue Pavan, and Beth Mitchell, Scottfield Students who took their first trip down the Gateway Of Champions on our fabulous lesson horse, Partridge Hill Protest, a.k.a. SparkyTheWonderHorse!! Sales, Sales, Sales!! With 20+ sales in the last 6 months, there’s a reason we say #ShopScottfield! Whether you are buying or selling, Scottfield has got you covered! Congratulations to all of these new owners of some of Scottfield’s finest equine alumni, and welcome to the team to our newest acquisitions! Agent for buyers, Manito Equestrian. Agent for buyers, Fire Run Farm. Agent for buyers, Champion Hill Farm. Agent for buyers, Ridgeback Farm. Agent for buyers, Woodbridge Stables. Agent for buyers, Kierson Farm.